A Chesterfield couple collaborates with Lorrien Homes to build out their lower level. 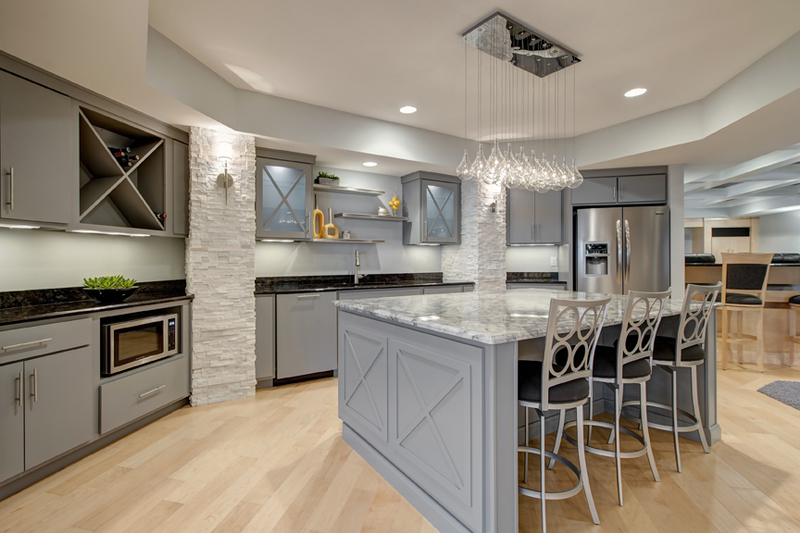 Design elements unifying the kitchen/bar area include the crosshatch motif on the wine rack, cabinet doors and island base and gleaming stainless appliances, cabinet pulls and floating shelves above the sink. Carpeting and a dropped ceiling enhance the theater's acoustic quality and "movie house" ambience. Archways and elegant detailing integrate the lower level with the rest of the home. It must take tremendous confidence to say to your builder, “surprise us!” But that’s exactly what this couple did when choosing Lorrien Homes to build out the lower level of their nine-year-old story-and-a-half in Chesterfield. Lorrien Homes’ Diana and Dana Dunbar are quick to point out that the overall project was very much a “collaborative effort” with the owners – with one exception. 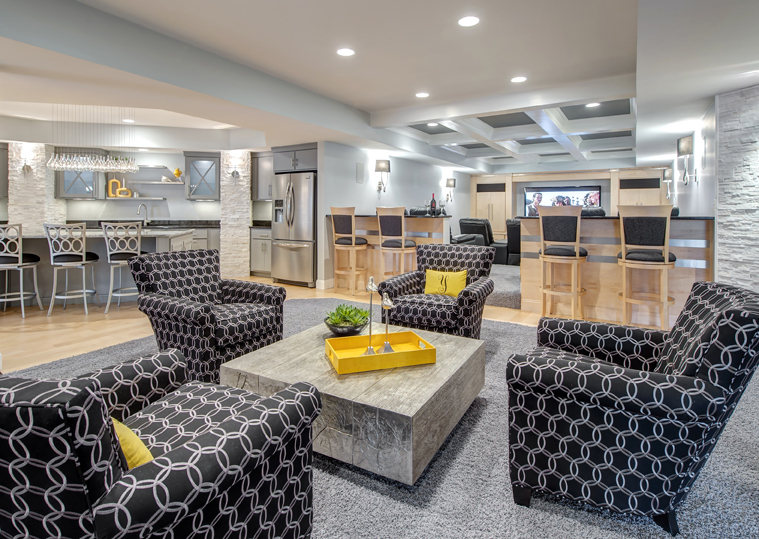 Their design/build assignment was to transform the unfinished, 1,500-square-foot basement into an entertainment center that would include a home theater, kitchen/bar area, fireside lounge, pool table room and ping pong/shuffleboard room. Left to Dana’s ingenuity, however, was the “surprise element” – a space that would be specifically created for the homeowners’ three young boys. 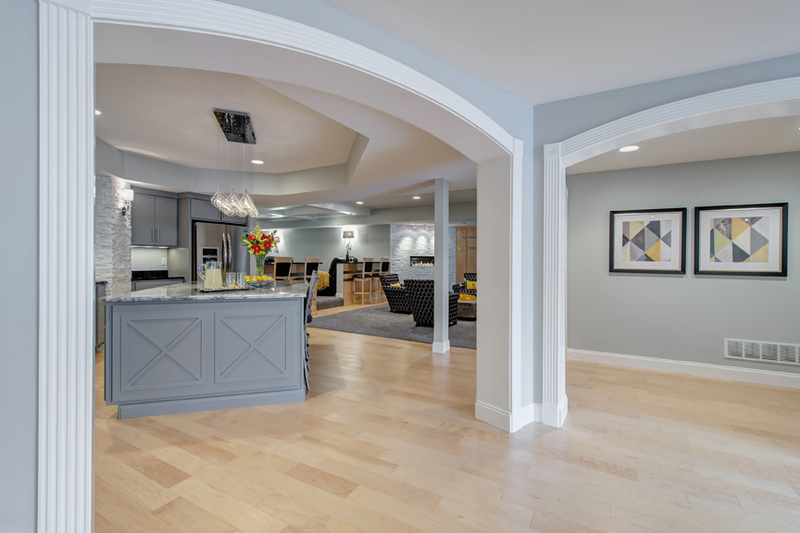 The Dunbars use Houzz.com, an online database for remodeling and design that has proved to be an extremely effective tool for helping the firm’s clients to explore their options, convey their ideas and ultimately record their final design selections. “We focus on communication with the client,” says Dana, adding that he is onsite daily to personally supervise the construction process. Dana’s first priority was to ensure that “the lower level would feel like it was part of the original home,” which has a clean, contemporary décor. Soft cool colors, archways trimmed with fluted columns and rosettes and vast expanses of blond maple plank flooring, cabinetry and paneling reflect the home’s established theme, and stainless steel inlays are a repeated motif throughout the entertainment area, linking the various spaces. “Consistency of materials and design elements creates a more fluid space,” Dana explains. Varied ceiling heights are another of the builder’s favorite design techniques, in this case both functional and visually appealing. 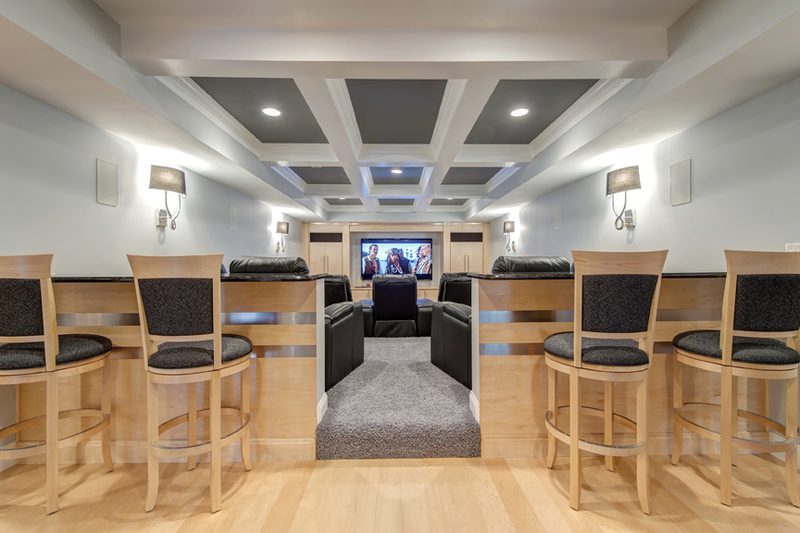 For example, the theater ceiling is dropped and coffered to create a more intimate “cinema” atmosphere. In the kitchen/bar, an octagonal tray added spatial volume while circumventing a problematic I-beam, and a simple tray ceiling provided necessary height in the ping pong room. Dana designed the youngsters’ space as a video room, cleverly hiding the entry behind a “secret” wall panel. Having worked with a company that did similar fiber optics for Disney, he also installed a “starry night” ceiling that the boys can operate with a remote control, much to their delight.